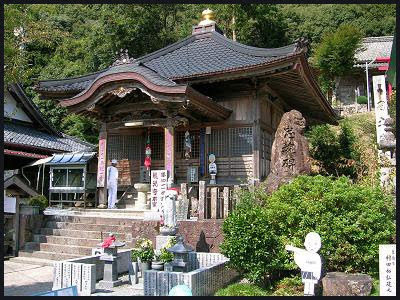 Temple 41 Ryuukooji 龍光寺 . There used to be a Shinto gate (torii) at the entrance to this mountain temple. 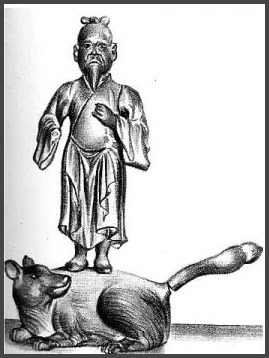 and asked Kobo Daishi to carve a statue of Inari Myojin 稲荷明神. 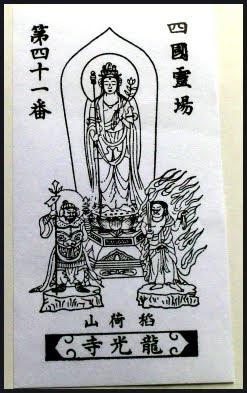 and Fudo Myo-O and Bishamon-Ten. 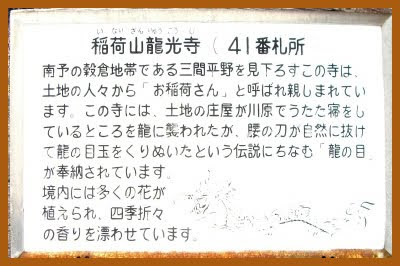 Even now the main temple festival is on the first sunday in March, when Kobo Daishi met the Deity. Prayers for a good harvest, health, good business and peace in the family are offered. Once upon a time, the village headman was sleeping at the riverside. The local dragon came by and tried to kidnap him. But the headman took out his sword and scratched the eyeballs of the dragon out. 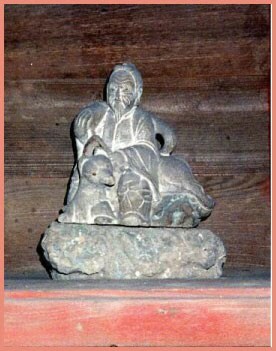 The eyeballs ryuu no me　龍の眼 are kept as a treasure at this temple.
. Inari 稲荷 the Fox Deity . They relate to the common symbolism of Dragon and Light. It might also reflect the quality of a good emperor in China, who was always seen as a "dragon". "Temple of Great Dragon Quality"